Which remote job sites are actually worth visiting? Good question. With the rise of remote work, there seem to be no shortage of work from home jobs. But, not all listings or sites are worth visiting. You see, a work from home job search is, well, a lot of work. You have to find out what kind of remote worker you are and then narrow your search to the right types of leads for you. Are you a freelancer or remote employee in the making? This all depends on whether you want to be your own boss or simply want an employee position you can do from home (think an office job without the cubicle or commute). Then you have to think about your career ideals and what’s important to you as a remote worker. After all of that is figured out, it’s time to get down to finding remote jobs. That’s when you can start to run into some pretty scammy parts of the internet or, worse yet, an MLM hun trying to recruit you. No fun. Fear not! Fortunately, your remote job search can be seriously simplified by visiting the right remote job sites — ones with endless leads and a variety of listings (with no scams or pyramid schemes in sight). First up is Remotive. This is not just a remote job site but a network of remote workers. You can browse their job listings for free or sign up for a paid membership to join their community (or both). Many of their job ads are from startups. And, as a result, the helpful content on Remotive is focused on finding remote work at startups, including their free webinar. As a bonus, sign up for their free email newsletter to get a digital delivery of remote job leads directly in your inbox. Commuting is no fun, especially when you factor in the average US commute at 25 minutes each way. Skip The Drive knows that and has created a job board that lets you, well, skip the drive. This is one of the many remote job sites that are free to use for job seekers, like you. Simply browse by category or filter by keyword. You don’t have to register for an account to do either. FlexJobs is a paid membership site for remote job seekers. With your subscription, you gain access to hand-screened job leads you can’t find anywhere else. Because of this, FlexJobs guarantees that 100% of their ads are scam free or your money back. This job board is perfect for beginners who don’t yet quite know their way around a remote job search. It’s also a great resource for freelancers who will need to continually source legit job leads. (Not sure if you’re a freelancer or employee? Find out here.) Use this link to sign up and be sure to use FlexJobs Promo Code FLEXLIFE to save 30% on your subscription. More than 650 remote-friendly companies and distributed workforces have used Jobspresso over the years to share their job leads. Some of my favorites include WordPress, Aha!, and Meet Edgar (to name a few). Did I mention that Jobspresso also hand picks and expertly curates their job leads? That means you can browse listings knowing that every single one has been manually reviewed and approved. When you need a job that isn’t restricted by location, We Work Remotely is the place to look. As far as remote job sites, this is one of the largest with more than 2,500,000 monthly visitors! Jobs are posted by category. Some popular options are Customer Support, Sales & Marketing, and Copywriting. You can also join the We Work Remotely Slack Community or browse top remote companies, all for free. Angel List is another of the remote job sites that features startups. As a reminder, a startup is a company that is newly founded. Typically, the company was started to solve a problem or fill a need. Startups don’t always hire remote workers, but they’re often remote-friendly. So, while Angel List has a lot of non-remote jobs, there are plenty of telecommute options too. Once you sign up for a free account, you can browse job leads. There’s an option to filter by remote, so you can easily narrow your search to only those jobs without a commute. Hubstaff Talent is on a mission to deliver the best freelance remote talent to companies that need help on tasks and projects. That’s where you come in. As an aspiring freelancer, you can create a free profile. This allows companies to find you and hire you to work. Hubstaff Talent is completely free for you to use, and can be a great platform to launch your career.If you’ve never freelanced before, that’s okay. I truly believe everyone out there has a skill or talent they can turn into a profitable freelance service. You just have to figure out what it is and get started. If you have some burning questions about remote work, remote.co is the place for you. In the lineup of remote job sites, this one is chock full of information. In fact, there’s an entire section that addresses some of the most common work from home questions you probably have. When you’re ready, view the job listings for current openings or browse companies that regularly hire remote workers. Either way, you’ll find plenty of options to kick your cubicle to the curb with companies like American Express, VIPkid, Cloud Peeps, and more. With nearly 16,000 researched companies on their roster, Virtual Vocations has no shortage of telecommute job leads. 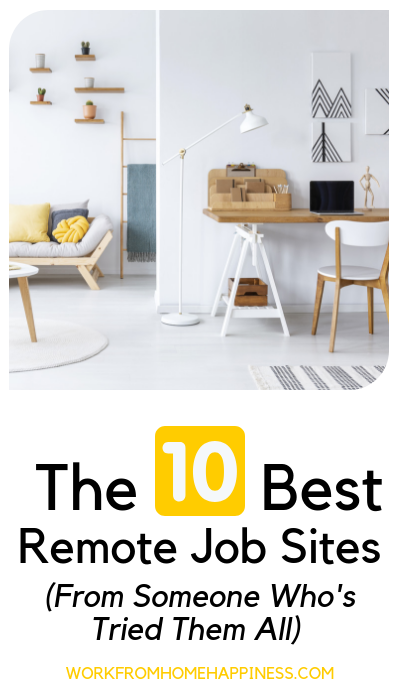 Like many of the other remote job sites on this list, Virtual Vocations also hand screens their job leads so you can worry less about scams and more about finding a remote job. There are also amazing free resources to help you create a resume and interview tips to get the job. You can get limited access to jobs and resources with a free account or sign up for the premium version for all access, including exclusive online courses. While The Muse isn’t just a place for soon-to-be telecommuters, it stills ranks as one of my favorite remote job sites. That’s because there is so much content created for career-minded pros, like you, including coaches and courses and actionable advice you can use right away. When searching jobs, make sure you use the “work from home” or “remote” keywords. This will bring up all listings with a telecommute option. From there, you can easily apply to listings or use some of their how-to articles to spruce up your resume or get active on LinkedIn. Remember, not all remote job sites are worth visiting. Some, are filled with “business opportunities” that promise work-from-home riches, but deliver very little in actual value. That’s why you should stick with only those remote job sites that are well known for both their job leads and the information they share. A work from home job search is already a lot of work. Don’t make it harder on yourself by browsing all the wrong remote job sites. Instead, stick with the ones on this list. They’re tried and true, will save you tons of time, and can help you finally kick your cubicle to the curb. You’ve got this. P.S. This post contains affiliate links check out my disclosure statement for more information.